A lot of people already upgraded from using the regular old light bulbs and have opted for smart bulbs and light strips instead. If you aren’t familiar with these, they’re also called the ‘clever lights’ that can easily brighten up your party or even improve your sleep using a simple app to fine-tune your lighting; that is if we’re talking about the LIFX A19 and the LIFX Z Light Strip. We’re going to focus on the products of LIFX which is a top option when it comes to color changing smart bulbs, light strips, and a lot more. Are these easy to use? Can you decorate your home with different colors to set the mood? Do you need technical skills and extra hardware to make these work? Let’s look further and get more information about the products and see if the smart bulbs and light strips from LIFX are worth purchasing. We all want things to be quick, easy, and convenient especially at home, so having smart light bulbs are one of the ways to upgrade your lighting to full wireless control. What’s good about these types of bulbs is that it can drop your energy consumption, especially when you’ve just really gotten around to changing your old bulbs with LED bulbs that are definitely more energy efficient. It’s also great that LED bulbs can last longer than 15 years under regular usage which means that you can save more money by utilizing the smart bulb’s useful features, namely remote operation and scheduling. For a brighter and more colorful place, you can check out the LIFX A19 Smart LED light bulb which is a great option to add more vibrancy to your home. You can set a good tone to have convenient lighting, and its app allows you to control a ton of colors just by using your smartphone. If you’re thinking that setting up is tricky or you need a whole lot of technical skills for it, relax because LIFX A19 is easy to set up: just download the app, connect the bulb in your preferred room, then you’re good to go. What we like about the bulbs and light strips from LIFX is that all of them are packed in a simple yet attractively-designed cardboard drum container that is durable enough to protect the lights. The containers also have a detailed list of all the main features and specifications of the bulb which is great if you’re actually comparing the product to a different one. Bulbs are kept nice and snug but don’t worry about anything breaking since the bulb’s head is made of durable plastic; for its base, it is slipped in a foam block piece to prevent any knocks from breaking the bulb’s metal fitting. Opening the top cover of the container, the first thing that you’ll see is the bulb’s flat end; just pull out and you’ll see that the bulb’s still connected to the foam holder. After pulling out the bulb, you will see the manual tucked to the foam base. There isn’t much in the packaging and no space is wasted when LIFX packed their A19 Smart Lightbulb in this well-designed container. When you look at the appearance of the LIFX bulbs, they don’t appear like your classic old light bulbs; these look more similar to most LED lights when it comes to the design: a plastic head that somehow resembles a plastic hockey puck that is set on a metal chassis. The bulb’s metal chassis is strong and durable so we can say that we’re quite confident with its built quality. It keeps the bulb’s Wi-Fi hardware, LED lights, lighting controllers, and the tiny computer in each bulb safe while also working as a heat sink to passively cool the bulb’s internal hardware. After trying out the LIFX A19 Smart Lightbulbs, we can say that these work well and are easy to install, but the thing that impressed us the most is its rich color and brilliance – you can say that it’s blinding compared to the bulbs of other brands. Aside from its brightness, it also has useful customizable features accessible in the LIFX app; you’ll be able to fine-tune your settings and control the colors of your smart LED bulb with just one click. Aside from being bright, convenient, and practical, we can’t deny that LIFX A19 is fun but most importantly, it’s a very reliable product that is up to par with the field. Now we’re going to talk about how to use and install the LIFX A19. This is the fun part which also makes LIFX’s products some of the best things to have for your smart home. To start setting up the bulb, all you need to do is to download the LIFX application on your smartphone or computer, register an account, then click on the plus button (found at the top right corner of your phone’s screen) then choose “connect light”. There will be a few instructions available then you will be asked for the following: your Wi-Fi connection, password, the name for your light and where you’ve set it. Once done, wait for the LIFX A19 Smart Lightbulb to blink since it indicates that you were able to successfully pair the LED bulb. If you have more than one LIFX A19 bulb, repeat these steps until all the lights have been connected. You will be allowed to make different groupings that you can easily control in a variety of ways. All of your LIFX A19 Smart Lightbulbs can be controlled from the LIFX app since everything you’ll need will be present upon opening it; control options that are available include individual lights, all lights, or groups. We also took note of one of the most notable features of the app and it is the ability to make the lights fade on or off over a given time. If you want to try this, just press and hold the group / light icon to bring up a pop-up menu; here, you will be able to select between ten seconds and thirty minutes to have the lights fade either on or off. If you want to customize the lights further, you’ll need to tap the name that’s found right below the circle. Doing this will lead you to a screen where you can customize the color, saturation, brightness, or the shades of white. Just like we said, installation is easy but you’ll be spending a lot of fun time controlling and playing with your lights. We know that LIFX’s products are very impressive and LIFX A19 is one of these. You can easily alter the lighting and atmosphere of your home in just seconds: if you want a romantic setting, set the lights for a themed party, or if you just want to brighten up your surroundings with warm lighting during a cold or rainy day, all you need to do is to choose colors on your LIFX app and you’re all set. Since it’s also easy to install, we highly recommend the LIFX A19 Smart Lightbulb; you won’t need to have any extraordinary technical skills which make it something really convenient for anyone who wants to quickly and easily create a new look for their home. Light strips have been around for quite some time and different brands have already given their fair share of these. It’s a good thing that LIFX made things a little more interesting when they introduced the LIFX Z which is a collection of multi-colored LED strips that you can easily set up. Let’s check out what’s included in the box when you purchase the LIFX Z. 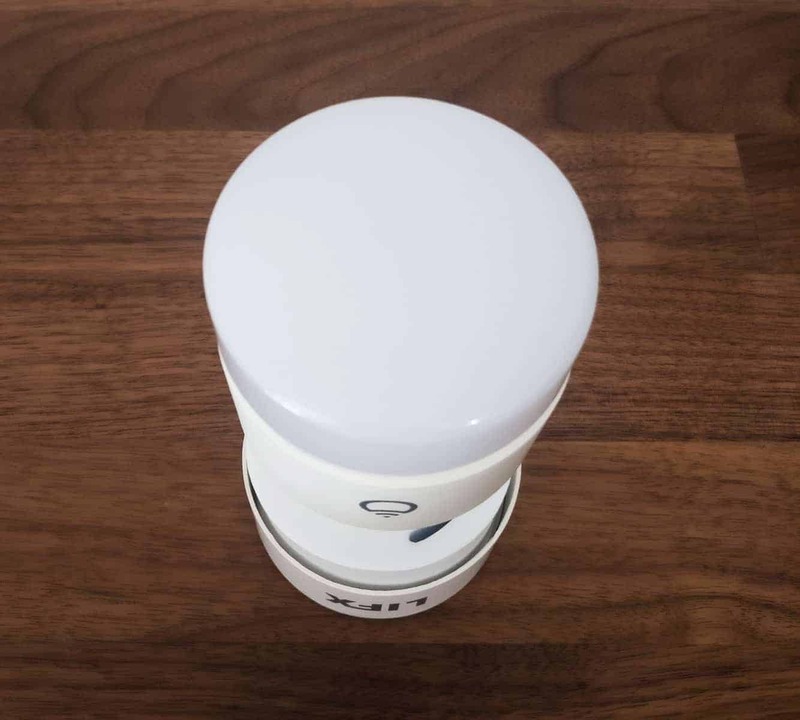 The LIFX Z comes in a durable and well-designed cardboard drum packaging that features a detailed list of the product’s primary features and specifications; this is something really convenient especially when you want to get quick details about the product. Once you open the lid, you will see the light strips neatly coiled on plastic drums which will make it easier for you to pull out. There are also three levels of the packaging where all the other contents are stacked throughout. Inside the container, you will see the following items: a power supply cable, two LED strips, a plug, an adaptor, and a little manual. We can’t deny that these vibrant light strips add a fresh dynamic to your home which is also something super fun since you can ‘paint’ each strip with diverse colors. Compared to other similar products that are around, the LIFX Z strips are categorized into 8 different color zones and by changing the colors of each, you can easily decorate your home with colors. Unlike other light strips that are available, the LIFX Z adds enough illumination to the strip since it gives off 1,400 lumens per two meters; though adding the extension kit will put an extra 700 lumens, giving it a total brightness that is 2,800 lumens. The LIFX Z also has other exceptional things in store for you such as color temperature that ranges between 2500 to 9000k, 16 million colors, 8 watts wattage use, a two-year warranty, dimming from 1 to 100%, and expected life of 23 years when the light strips are used 3 hours a day. There are two options for you to choose from when it comes to the LED strips and these are the Starter Kit or the Extensions – the only difference between these is that you will get an additional LED strip if you choose the Extension model. After trying out the LIFX Z, we can say that it’s a pretty impressive product to have in your home; it doesn’t only make your house look great but it is also easy to install and operate. The white customization and color quality are definitely notable, and given that it also has a lot of options when it comes to the colors make it a good choice that is worth the purchase. Additionally, the strips are crisp and brilliant so there isn’t any drop in the quality while the colors change; and also, the lights remain extremely responsive even when it is being controlled from the app. You don’t need to have technical skills to install the LIFX Z and you will only need a couple of minutes to complete the setup to start painting your home. First off, you need to download LIFX’s mobile app so you’re required to have a phone that makes use of Android or iOS. Once you’ve downloaded the app, open it and you will be asked to link to the LED’s Wi-Fi connection; you will need to scroll and search for a network named LIFX. Once you’ve successfully connected to the strips, you’ll need to link to your own Wi-Fi network, then after that, you’ll have to figure out where to set your LED strips. Before positioning the LIFX Z, you will need to connect the light strip to the cord; just make sure that the 3M adhesive is facing the LIFX logo or you won’t be able to connect this properly. Once that is done, you can peel off the plastic tape behind the LED strip then position it on the surface of your choice such as behind the TV, beneath the countertops, etc. When you’ve finally set the strips to the preferred location, you can now connect this to the power supply then plug it to the nearest outlet. Keep in mind that you can bend these at a 90-degree angle but make sure to avoid bending it directly on the LED light. We didn’t have any problems installing and setting up LIFX Z which is something really convenient, especially when you don’t have great technical skills. Color changing lighting is a smart novelty for your home and overall, we were highly impressed with the performance of the product. It not only offers us with an easy to use app and a ton of colors to choose from, but it also gives us a couple of unique features that aren’t available on other light strips: additional lumens when the strip is extended, painting in multiple colors, as well as color zones. Installation, as we have seen, is also very easy so we highly recommend the LIFX Z to illuminate and make your home more vibrant. After you’ve downloaded the LIFX app, open it and head straight to the Themes option where you’ll find the available preset themes; it has one great feature that we’ve really enjoyed playing with and that’s painting colors right on the strip. A color palette is present so you can click and drag the colors of your choice across the strip. I think this feature is pretty useful when you’re celebrating the holidays, having a specific theme for a birthday party, or if you just want to have a relaxing atmosphere with lights that are dim enough to give off a cozy feel. If you’re not really into the painting game, you can just select from a ton of preset themes that are available and these brighten up the light strip consecutively. As for the white lights, these works similarly to the LIFX bulbs where you can actually change the LED strips to various shades of whites; just remember that you can’t have multiple whites along the strip. All in all, the LIFX app is easy to use and very intuitive with a connection that is mostly reliable; this actually depends on how stable your internet connection is, the size of your house, as well as the distance of the strips from your router. You don’t need to download another app if you also have LIFX bulbs in your home since all the LIFX lights can be controlled using just one application. You can see that LIFX also provides us with a lot of conveniences – from how easy it is to setup and install the lights, to using the application to paint your home. If you head on over to the official LIFX website you can pick up the LIFX A19 for $74AUD and the LIFX Z for only $129AUD.